Avce Student Branch of IEEE in collaboration with IEEE ADSF SIGHT organized a one day seminar on “Applications of Magnetic Design” on 3-10-2018. 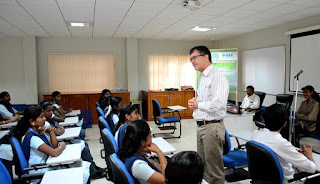 Dr.Daniel Lottis, Principal Engineer, Western Digital, California and Chairman, IEEE SIGHT was the resource person for the seminar. Nearly fifty students and faculty from department of ECE participated in the seminar. The seminar enabled the attendees to understand the importance of magnetic design. It also made them know modern magnetic materials and to learn different techniques currently employed in the industry for magnetic design.